Reviews | One-Piece Aluminum Scoop - 85 oz. This 85 oz. 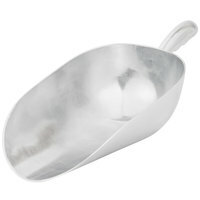 metal scoop is perfect for scooping ice, flour, and other bulk ingredients! Made of aluminum, this scoop has a classic appeal and feel. Its material makeup, along with its one-piece construction, gives it a sturdy build, ensuring you a product with longevity. A smooth handle provides a comfortable grip. The handle also has the capacity stamped into it, which makes it easy to identify the correct portion. This allows for quick identification, saving you prep time. These are your forever scoop! They are very heavy duty & very easy to clean. We used to use the plastic scoops & found they would always break. These have been great & I see them lasting a long time! These aluminum scoops are great for scooping kettle corn. They easily are cleaned and they fit perfectly into the ends of our bags for easy filling. These do a great job. We use them to portion out our buik ingredients. Easy to clean, nearly impossible to damage. Very happy as we used these to replace plastic ones which chip and stain. We switched to this aluminum scoop after having 2 plastic scoops break on us. This scoop is extremely durable and holds up well to continued use. Only bad side, it gets extremely cold to hold! The champion of ice scoops! Works as well as anyone could expect an ice scoop to work. It's seen plenty of use and hasn't chipped yet. Super durable and makes scooping ice a breeze. The shape of the scoop allows you to fill ice bins very quickly without spilling ice all over. This one-piece aluminum scoop is perfect for ice (or anything else that needs scooping out!) and is a great quality and will hold up nicely. This scoop is pretty large and holds quite a bit. We use it to scoop various ingredients such as sugar, saves us a lot of time. Ice scoop definitely exceeded my expectations. It is bigger than I imagined, it definitely gets the job done in half the amount of scoops of regular size ice scoop! Great Scoop , we use it to scoop flour and works great , well made and heavy duty , the price is good and i highly recommend it . We are sorry this item rusted, we recommend hand washing this item and drying right away to prevent this from happening. We use this wonderful scoop for our ice. It's large capacity fills up our ice buckets quickly and efficiently. The single piece construction, makes the entire scoop strong and resistant to breakage. This is same one I used in Broncos liquor store . Located in Detroit Michigan . It would fill the bags of ice in two scoops . I would do fifty bags in less then fifty minutes . Love this scoop. Very large yet lite weight but very sturdy construction. Easy to grab and able to sustain scooping large about of ice with no bending. Sturdy and super convenient holds a lot of ice in just one scoop. Order these now and you can't go wrong. Makes scooping ice much faster. We use this scoop for our flour bin. This is perfect because you can't use a generic cup since the health department requires a handle on all utensils in product. A little larger than I expected but still suits our purposes. Bought as an ice scoop, feels solid, should hold up for a long time. This is a perfect scoop for any ice machine. And also state required in most states. Easily fill your ice bucket with this scoop and sanitary. Best quality ice scooper I've seen. Ordered and shipped same day. PERFECT! Heavy duty will last forever. Would recommend to anyone who scoops ice daily. After our free plastic scoop that came with the ice maker broke, we tried this one piece metal scoop. No more worries chopping into that ice berg that always forms over night in the bin. It even fit into our existing holder. This is the perfect big scoop to replace your cheap plastic ones when they developed cracks. Needed a huge scoop for my large amounts of hot chocolate mix and this one fits that description perfectly. Seems like it'll hold up for a long time. This is a burly scoop. I would be surprised to see this thing break. Much better than the plastic ones. I would recommend for serious scooping. Perfect scoop for our ice machine. Lasts longer than plastic in my opinion and moves some serious ice to keep our beverages nice and cold. Finally an ice scoop that doesn't end up breaking in the ice and therefor causing you to have to dump all of your ice! The metal is pretty decent quality, just don't forget to not keep it in the ice! Great item! This was perfect for our needs and exactly what we were looking for. Webstaurant always has high quality, good value equipment and supplies! Such a big ice scoop this sure gets the job done. Too big for any of our plans but we sold it to a friend who uses it for crushed ice and can't Stop talking about how big and great it is. We needed a big ice scoop and this one is just right. I'm glad we chose this one, less trips to fill up and go. This is a great ice scoop for getting ice from the machine to the bins in the server stations. It is quite large so you can fill the bucket faster. Ice scoop will fill a bucket very quickly. Perfect size for larger jobs that require a lot of ice. Great time saving product. Very well made. Fast shipping and a high quality item. Webstore offers amazing price, not just on this item, but all items which saves our bank account hundreds. Thank you! This is the ideal flour scoop for our kitchen. When doing large batches of dough it only takes one or two trips to the flour bin! It's very easy to clean and the handle is comfortable to hold even when full to the brim with flour. Bought as a replacement for a plastic ice scoop that had cracked. This scoop is very durable and certainly outperforms plastic scoops for ice. The 2.7 Qt size is large and with ice in the scoop it is fairly heavy. But makes quick work of filling our ice bin. We have two of these aluminum scoops. They're sturdy - I can't imagine the handle coming off. We use them in our roasterie to scoop beans. No complaints! Dont every buy a plastic ice scoop again. Because when it cracks 3 months in you will wish you bought a metal scoop that will never break. It is huge and perfect and strong. solid construction, much better than plastic, plastic cracks and breaks, this is a solid molded piece, no connections or parts that can break or wear out. Great heavy-duty scoop. Being one-piece allows it extra durability. We use it to scoop large amounts of flour or ice into our bins. Will buy again! A classic. Great size for grabbing flour. Nice high sides means you can move it around without loosing flour. As seen in the picture, used for adding flour into a mixer.Good solid construction and handle. More than just an ice scoop! This is a kitchen tool that can be used for any number of things, from scooping ice, to transferring foods. The size of it is huge and perfect for filling up ice buckets, or other high volume uses. It is light weight, yet has sturdy, quality construction. Highly recommended. We used to have the plastic scoops. These look so much better an clean up a lot easier. We use them in the restaurant and the trailer. Big ice scoop for refilling bar tubs from a larger ice machine. Works well to fill up a 5 gallon pale. Lightweight and durable design. we bought this large 85 oz ice scoop to replace a plastic one that was breaking, and what a great trade up. super strong and solid. wont have to buy another one. We use this for scooping ice out of our ice maker after the plastic one we had broke. This one has been working well for over a year now. Very sturdy and does not flex or bend unlike the plastic ones. We replaced a broken plastic ice scoop with this and it works great its just the right size for filling a ice bucket it is made well and should last a long time. Large scoop that is perfect for bulk items! Great for flour and sugar bins! Good addition to any bakery! Great for ice when you need a lot at one time! big scoop is just that, big.. certainly does the job. You better have a strong hold to bring this monster up. but it cuts the loading time in half. handy, lightweight, sturdy. great product for filling our ice bucket to fill our coke soda fountain machine with ice. will purchase this product in the future. I wasn't sure what size of scoop I needed. The prices were so reasonable that I ordered one of each size. This jumbo size works great for scooping large quantities of ice.